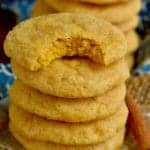 This is a pumpkin cookie recipe that you all have really enjoyed, so I thought I would add a video to it and update the photos. The post was written in September 2015 and the photos were just updated August 2017. This week marked the five year anniversary of Elliot’s death. What is so weird/tricky/frustrating/maddening about grief is that you don’t really know how or when it will strike. Four years ago, when we should have been celebrating Elliot’s first birthday, everyone was bracing for us to struggle through September 9th, the first anniversary of his death. But it was September 1st, when we should have been taking pictures of him shoving cake in his mouth, that really floored me. And this year while I was really anticipating Elliot’s birthday to be rough, it was the anniversary of his death that was hard. I have never really talked about his death publicly. Probably because we had to make the unbearable decision to take him off life support, and I know that that is controversial. We did so with a lot of counsel from his doctors. And when I say counsel, I mean I asked them what they would do if it was their own child and watched their eyes fill with tears at the mere thought. They made it very clear to us that our options were very limited, and were so kind in helping us come to a decision. I will never forget watching Gavin say goodbye to Elliot . . . though he didn’t entirely understand what that meant. I will never forget Elliot squeezing my finger and second guessing myself and having his nurses reassure me that this was common in patients with only lower brain functioning. And I will never forget Nathan and I promising Elliot that we would never look at this life as a tragedy. So many people have asked me how I possibly made it through losing a child, and honestly the answer to that question is a work in progress. But what I come back to over and over and over is that moment when I was holding him and he was taking his last breaths and he was all unhooked from machines and I was promising him that I would not let his death be a black mark on my life. Just before school started this fall, and I promise this relates, Quinn drew a picture of me with something giant. I asked her what it was and she said it was me . . . sad because I missed her because she was at school and with a giant sandwich. She gets me. I’m an emotional eater. Lol! So . . . . I made these cookies on the anniversary of Elliot’s death this year. The foundation of these cookies are these perfect sugar cookies that I made 7.2 million times while my mom was dying. They are my ultimate comfort food. Scratch that. The cookie dough for these cookies is my ultimate comfort food. 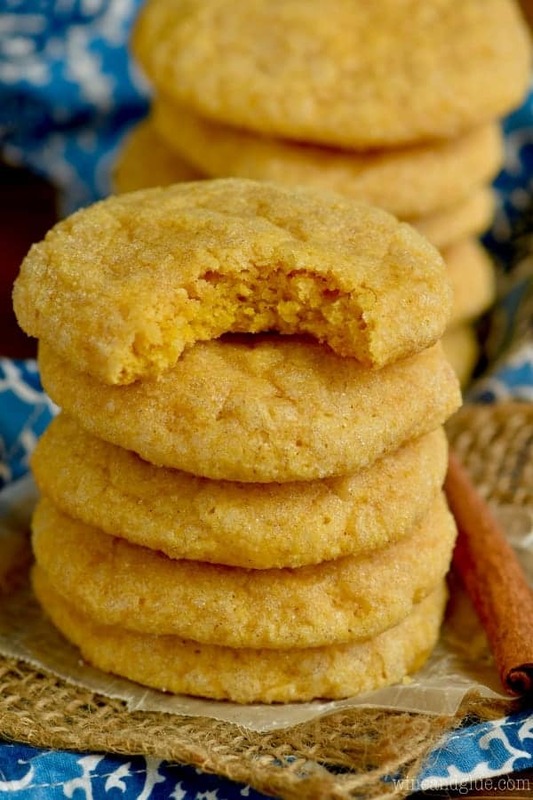 I had had a conversation with Cathy just a few days before making these pumpkin sugar cookies and she mentioned these cookies, and the ratio she used of pumpkin and eggs to make the perfect cookie. She was dead on! I used it to make the pumpkin sugar cookies and it resulted in what might be the best damn cookie I’ve ever eaten. I’m not kidding. So I’m not going to say that these soft pumpkin cookies fixed the anniversary of Elliot’s death. But if I’m being 100% honest, they totally did make it a little easier. In a large bowl, whisk together the flour, baking powder, salt, and cinnamon. Set aside. 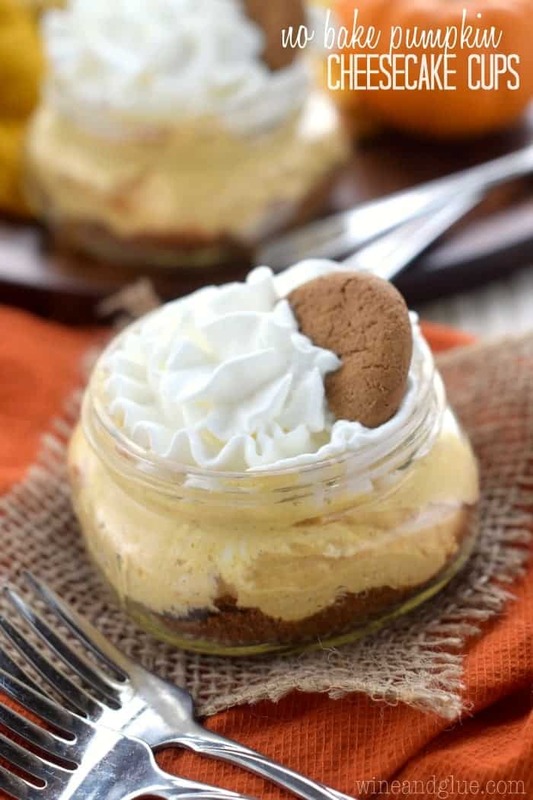 Mix in the egg yolk, then vanilla, then pumpkin until well combined. Preheat your oven to 350 degrees and refrigerate the cookie dough for 20 minutes. Roll the dough into one inch sized balls. Roll in sugar. Place on a parchment lined baking sheet or silicon mat and press down slightly. Space the cookies about two inches apart. Let cool on the pan for about two minutes before moving to a cooling rack to cool completely. You MUST make this Pumpkin Pull-Apart Loaf from Crazy for Crust! 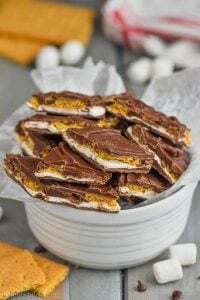 This Pumpkin Pie Crunch from Spend With Pennies looks like a must make! 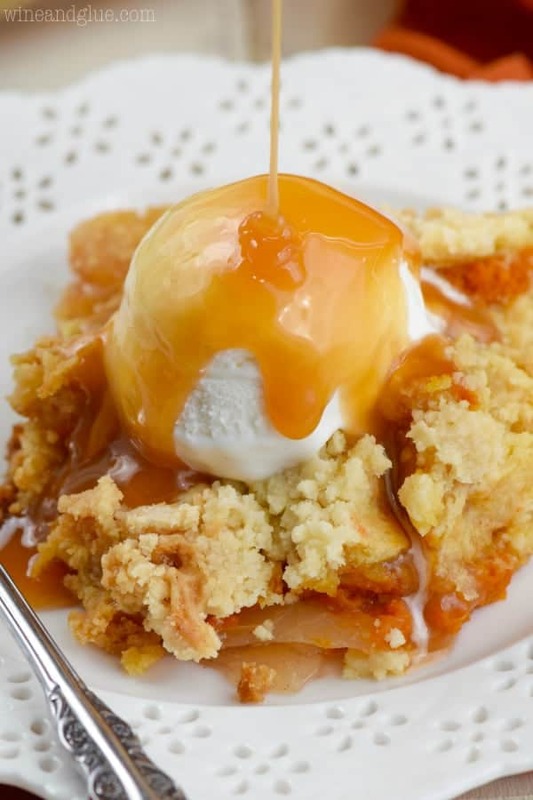 I would flip for this Pumpkin Pecan Cobbler from Well Plated! September must be such an emotional time for you-so much good and sad to remember. Thinking of you! on a lighter note. these cookies look awesome. And you make baking good cookies look easy! I’m sending you tons of hugs!! Lisa, hugs and prayers for this tough month for you and your family! Lisa, I’ve said this before, but I’m bowled over by your strength. You just made me tear up. I am sending you all the positive feelings and emotional support I’ve got your way right now. Hi! 🙂 how many cookies does this make? Amy, I am so sorry for your loss. Isn’t it amazing how a whole time of year can be changed by a loss? Much love to all of you during this time! Words cannot express how sorry I am for your loss, no matter how long ago. I read this at work and am trying to privately wipe my tears. Sending lots of hugs your way. Made these today and they are some of the best cookies I have ever had or made. I will be making these again. Thank you for the amazing recipe. Amanda, comments like this make my day. Thank you and your kind heart so much for coming back to tell me how much you loved these! Now, I can’t bake at all and usually end up with kitchen disasters, but these came out perfect!!! 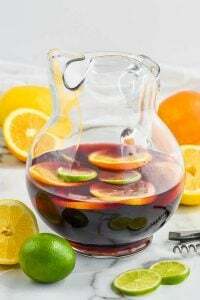 Sooooo delicious and easy to make. Thanks for the great recipe!?? These sound good! I want to make these for my son’s birthday party. Can the dough be made ahead of time ? I wasn’t expecting to cry when I opened up this recipe but I’m sitting here with my sleeping 15 month old and I just couldn’t imagine. Your strength is incredible. Oooooooo, that sounds amazing Amanda! So glad you liked them! Lindsey, oh, I’m so sorry for your loss. I know that there aren’t words that I can say that will make it better. Just know that I have been where you are now and it does get easier. Please reach out to me whenever you want! And I think that baking is a GREAT distraction. One I’ve used many times. May I know if this cookies is soft or crunchy type cookies? Do you think this cookie would hold its shape if it was rolled out and cut? Thanks. These cookies sound amazing!! Going to make them now. Your story breaks my heart, I can’t imagine what you have went through and still continue to go through everyday. You will be in my prayers. Thank you so much, Stephanie! And I hope you like the cookies! I can’t even imagine how you can get through the loss of a child. Sending you hugs and blessings. These cookies do look amazing, I can’t wait to try them! My neighbour gave us a pumpkin the other day, and I’ve been wondering what to do with it. You used puréed pumpkin. Was the pumpkin cooked beforehand? 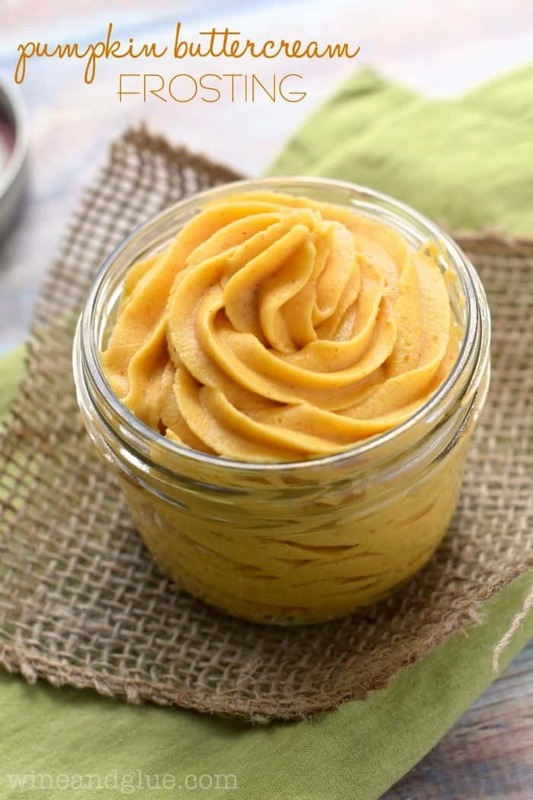 How would you purée raw pumpkin? Thank you Gloria! I used canned pumpkin and what I have heard from professional cooks is that there is virtually no difference between fresh and canned pumpkin. But! 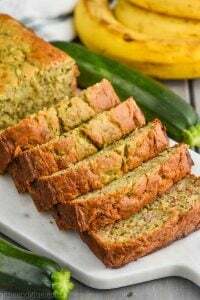 If you want to cook it, cut it in half, discard the seeds, place it on a baking sheet (lined with parchment paper) and bake at 350 for about an hour or until it is fork tender. Pull out the the inside of the pumpkin and smoosh it with a fork. Discard the skins. You’ll have a lot left. Thank you for sharing your story. Today my son and I made “Elliott’s Cookies” with he and other children taken far too soon in our thoughts. I am sorry for your loss. Oh, thank you so much for leaving this sweet comment, Melissa. Mandie, I’m so sorry for your loss. I always want to give other moms who have lost kiddos a GIANT hug. So please consider this a giant virtual hug. I hate that you are a member of this club with me, but I’m happy to have other members who get it. 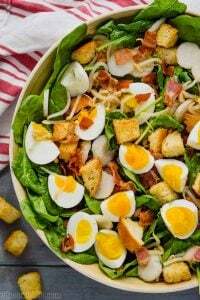 Thank you for sharing this recipe. I just finished making them and even tried a few “variations”. 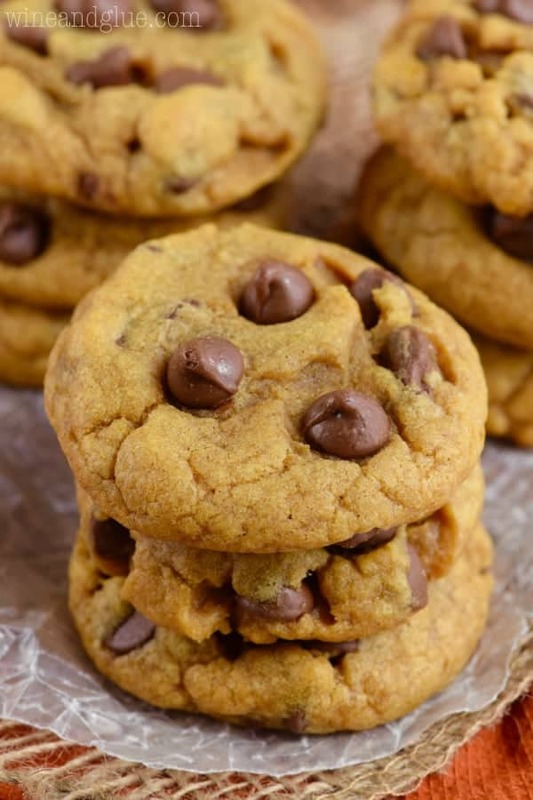 I added some mini chocolate chips to some for my chocolate loving grandkids and on others I added some pumpkin pie spice (Cinnamon would work too) to the sugar when coating them. I mean, you can feel free to try *anything* with this recipe. I think if you skip the ceiling time they won’t bake as nicely, but they will still be delicious. These cookies are absolutely amazing. Thank you so much for the delicious recipe- they were a huge hit at a friends gathering that I went to last night. My husband isn’t a huge fan of pumpkin and I lost count of how many cookies he ate. He raved about them! The only thing I did a tiny bit different was that I rolled them in a cinnamon sugar mixture instead of just sugar. I’m a sucker for cinnamon! Thank you so much. Alright That’s it. I have to sign up for your emails! Too much good stuff here -I’m a total Foodie-can you tell? Mine didn’t have much pumpkin taste, and I’m not sure how to adjust a ratio by adding more pumpkin … any ideas? They were great otherwise!!!! Kim, that’s tough because the pumpkin really changes the baking it doesn’t just go in for the flavor. You would have to play around with it. I’m so sorry, Linda. I’ve loved the pumpkin flavor every time I’ve made it. I’m so sorry Sam, that stinks! These are one of my favorites! 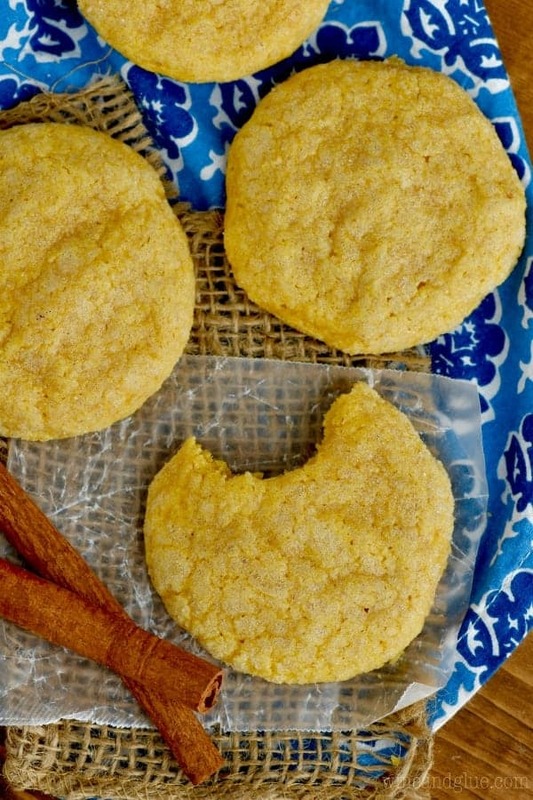 Stumbled upon your recipe and blog while searching for a quick pumpkin cookie recipe. My husband and I read about your beautiful Elliot while these baked. I will be driving these cookies over to a fellow mom friend with a brand new baby girl instead of eating them all like we planned. A very small act of kindness, but done with your sweet boy on my mind and heart. Laura, that made me cry. Your friend is lucky to have such a good hearted person in her life. Would they work for cutouts do you think? I really don’t think they would Melissa, but I for sure need to come up with a recipe for those! Made these using a chia “egg” and vegan butter- they are delicious! Oh, Lisa. I always hate hearing that someone else is in this awful club, this grieving parent club. But I’m also grateful for others who understand what it means. What a touching story. I admire your strength. And I will definitely be baking these cookies in the upcoming months. Thank you. Thank you too much for your kind words, Elaine! what a sad, emotional, and beautiful site you have here.You have written well of the grief at losing your precious son, and I can not imagine the pain you have been through or the decisions you have had to make.All can read of your great love.I didnt expect this when i was looking at a sugar cookie recipe!Just so you know a I will say a prayer for you as I make your cookies, and tell all who eat them in a small town in Australia of your courage and story. Oh Karri, thank you! So many people don’t know what to say and opt to say nothing. I appreciate more than you can know that you said something. Thank you. Thank you so much for this sweet note, Karen! My daughter, Quinn, was born just 11 months to the day after Elliot died, and she talks about him all the time. It’s both heartbreaking and amazing. And as you said, I’m sure it always will be. Read your post and want to extend a hug…our son died at age 19, in 2002… March and then his birthday month of April are very hard for us.. I understand and am glad the baking helps. Thank you so much for your kind words Joan. And I’m so sorry for your loss. I swear it is like losing an arm. You learn to go on, but life really isn’t the same. I’m so sorry to hear your story. Today I’ll be baking these in honor of Elliot. 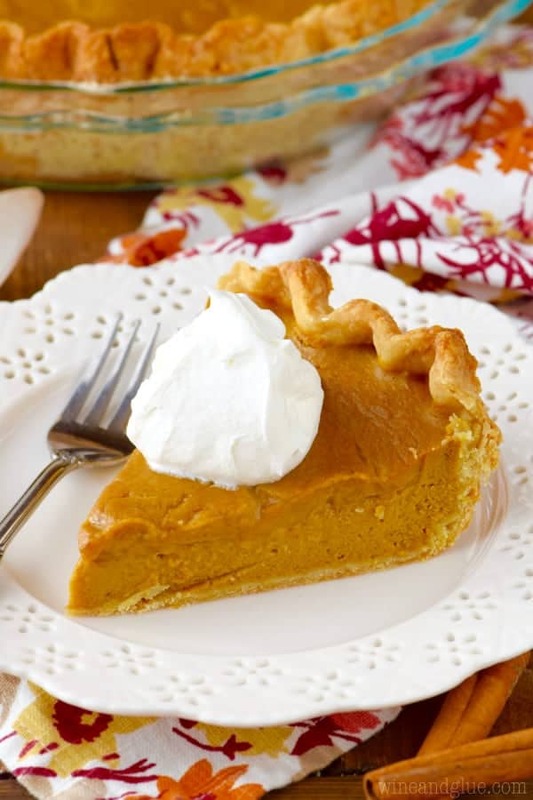 Do you use the pumpkin pie filling that has sugar and spices in it or the one without? Wow! These cookies are perfect. I was worried they would be bland or not have enough pumpkin flavor, but oh no. I would not change a thing. Better than expected. I’ms o glad to hear that Ashley! Hi! I made these cookies for the Thanksgiving holiday with fresh pumpkins from our garden! I also added a cup of semi sweet chocolate chips. They were simple, easy, and delicious!!! The perfect recipe for a busy momma. And I really didn’t have to modify for high altitude. I added a pinch more flour but that was it. Thank you so much for sharing!! I’m so glad that you liked them Whitney! If I made these, and then froze the dough after rolling, would it be OK? I haven’t tried that, but I Think it would be fine! Thank you for your story..you give us all strength. My grandpa’s name is Elliott. I k re I just had to try your recipe. They are the best sugar cookies I have ever made. When you’re right, you’re right! Than you for your kind words Anna! I love that so many people are reading about my Elliot and thinking about him. Thank you Loretta! And sending you love. I lost my mom as well, and I miss her just about every day. Never thought of such cookies. You really amazed me! I absolutely loved these cookies. I’ve made them a couple times and I have found that if I add about a 1/4 teaspoon of pumpkin pie spice, the flavor is a little bolder. Thank you s ok much for the recipe! So glad you like it Olivia! These cookies sounded so good I had to try them. I did, however substitute one fourth of a cup of brown sugar for one fourth of a cup of the granulated sugar for a little more flavor.. Also, I added some cinnamon to the sugar to roll them in. 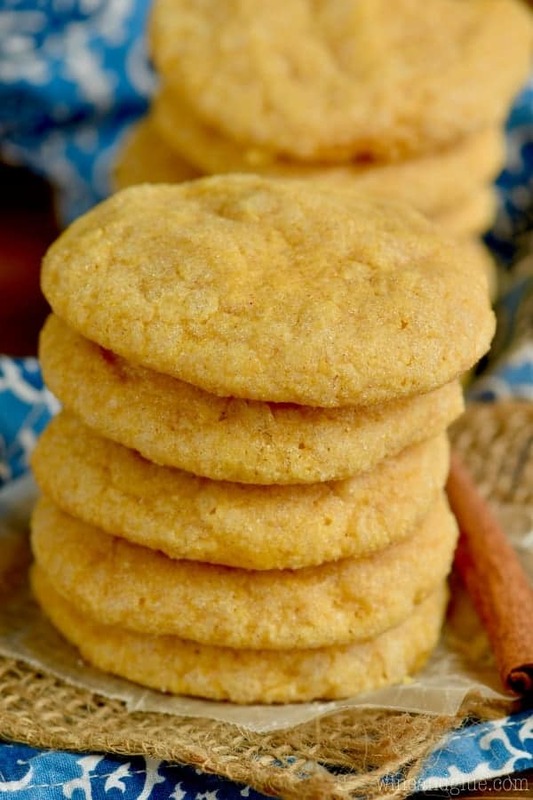 They turned out fantastic!….like really good snicker doodles. Also, the little unbaked balls freeze really well. Hi Lisa! 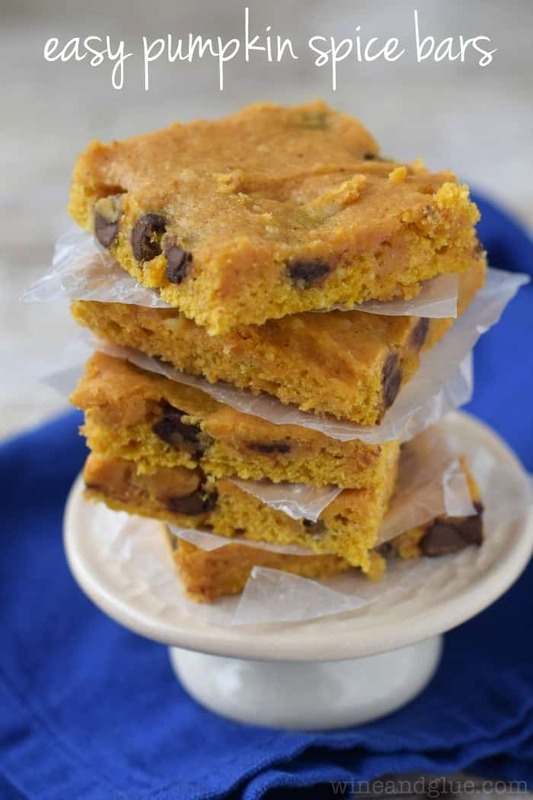 I first tried this recipe around Halloween when I had a ton of pumpkin puree leftover from a (failed) smoothie recipe…. wow, these are amazing! They baked up so perfectly. Never in my life have I personally baked such a perfectly cooked cookie. My husband and I ate the whole batch in three days…. So, now I have decided to make these as part of a work gift for my coworkers! I wanted to ask you — would it still bake up just as well if I prepared the batter mix a day ahead and refrigerate so that the following evening all I have to do is bake the cookies? I plan to double the recipe. Yeah, I think that it would work great keeping it in the refrigerator over night. Make sure you cover the dough and if you pull it out and find it hard to scoop, I would just give it a few minutes. Wow! These look good, Lisa! They just made the top spot on my “must make” list! ??? ?